I lost my Dad on Christmas Eve when I was just 16. The next year my Mom, Grandma and I took our holiday grief on vacation and found ourselves on a beach in Hawaii for the holiday season. It was a great way to break with the traditions and memories none of us wanted to face. My most vivid memory of that Hawaiian vacation was sitting next to an older gentleman at dinner on Christmas Eve and noticing he was wearing the exact same sweater my Dad would’ve been wearing. It brought my grief right up to the surface and I left the dinner to go down to the beach and cry. Needless to say it’s been a long time since I felt the untarnished joy in the holiday season. But, I believe that we are deserving of joy during the holidays… even if it comes balanced with the heart ache and longing for the person we love and are missing deeply. In my book, From Grief to Growth, I talk about an essential element of healing is learning to hold both joy and sadness in the same moment. There is no more challenging time to do this than the holidays. 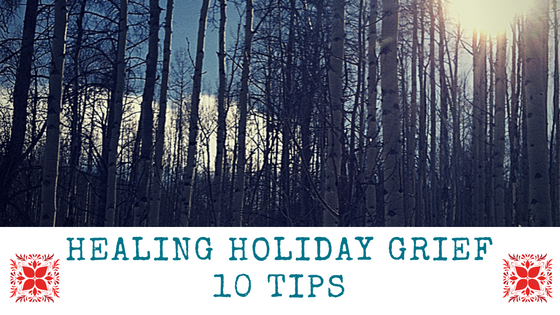 Which is why I put together 10 easy to follow tips that will support you as you navigate this season. I don’t like to say ‘survive the holidays’ because I want to encourage you to have the mindset that you are always fully capable of more than survival. Last year I did a live webinar where we discussed these ten tips and this year I sent them out to everyone on my list. (If you want to receive emails from me, click here to sign up) Then I thought I should just put them in a blog post so that you can share them with your communities! These are simple, practical tips that don’t require a lot on your part, but are focused to help you the most this time of year. Enjoy! #1 Make a list of the events/traditions you are most concerned about. Often much of our angst comes from not knowing what’s going to happen or how traditions and events are going to feel different after the loss of a loved one. In the flurry of activities that always surround this season, you are the only one who knows what traditions are important to you and which ones worry you the most. Take some quiet time to think through what specific traditions you are most concerned about. Your inner knowing has the answer. You might immediately be pulled to an event or activity. Notice how your body feels, the sensations and energy around the activity. If nothing comes up immediately then begin to bring your thoughts to various holiday activities. Check in with each one – tree decorating, cookie exchange, for example. How does each one feel, what comes up? You might find some are more emotionally charged than others. For now, we’re just taking the baby step of checking in. We’ll figure out what to do with them later. Be open to the idea that some traditions you will want to wrap in love and keep, while others will need to be shelved for a while (and maybe forever). Recognize the traditions you keep will never be the same, but keeping them honors the love you feel for the person you lost. Every year will be a little bit different and what feels right this year, might not feel the same in the coming years. Grief is a process and you must be willing to evolve with it. Always be open to what will help you move forward in your grief… and sometimes we need to go back to go forward! Get out your list from tip #1. See if you still feel the same about the events/activities on this list. Now, let’s take the next steps. Which events are too painful this year and it don’t feel right? What or how can you modify an event? If you are undecided on some, come back to your list again later or sit with the idea of doing that event and see what comes up. will touch on that in another lesson. Right now you are checking in and getting clarity. #3 – Brainstorm ideas. How you want to honor your loved one. Even if you decide to escape the entire holiday season and fly away to Hawaii for the holidays (done that) it’s important that you take time to honor your loved one. It could be with a donation of time or money, or creating a sacred space or new tradition. No matter what you decide, be mindful about setting time aside to actively honor your loss. What would you like to do this year to include your loved one in the holiday season? What do you need to do to make this come to life? Write your thoughts down below. Quite simply – Cry. Don’t be the tough guy (or girl) who pretends it’s all good. It’s not! You’re going through a season or anniversary without someone who was a very important part of your life. By yourself or with your besties, it doesn’t matter, just let it happen. Another way to look at this is – are you checking in with yourself to know what’s going on emotionally & physically? Are you filling your days with busy activity to disconnect from the emotional heart ache you would feel if you had a moment of downtime? Or perhaps you are withdrawing from friends, family and social activities. There isn’t a right or wrong, but we need to be aware of our tendencies to protect ourselves or how we might fall into negative coping strategies. Sometimes a good cry is a better reset than the work we put into avoiding our reality. Do you need a good cry? #5 – Tell friends & family how you are feeling about upcoming events. Your friends and family might know exactly which activities you’re going to have a hard time. What might be hard and/or memorable to them might not be the same for you. Generally speaking, family & friends want to support you. But, you are the only one who knows what you need and how you are feeling – don’t make it harder for them by expecting them to guess what this is like for you. We all experience grief differently. Share your fears, concerns and desires. Express what’s important to you or how you would like to handle a specific event. It doesn’t mean you will always get what you want or need, but it means that you have given voice to your grief and honored your process. There is no more important time to laser focus your energy on self-care than during the holidays. Lack of sleep, poor food choices, increased alcohol consumption, decreased exercise, increased stress all add up to a massive grief hangover! Your emotional self is already on overdrive and this will leave your immune system susceptible to illness and your physical body exhausted. Make hydration, sleep, whole foods, stress management, and exercise a priority leading up to and including these seasonal events. List all the ways you need to care for yourself. Some examples: eating a healthy breakfast, drinking more water, going to bed 30 min early, journaling, being outside, skipping that 2nd or 3rd drink at a party. This is a continuation of Tip #6 on self care. Even if you are taking care of yourself notice when your tank is getting close to “E”. This is especially important if you are the type of person who likes to stay busy to keep their mind off things. Exhaustion (physical & emotional) is often the root cause of emotional meltdowns. And, as you know, grieving is emotional exhausting by itself, then you add the emotional stress of the holidays and your tank is already half empty! It’s OK to say ‘no’ to events, or change your ‘yes’ rsvp to a ‘no’ at the last minute if you notice you are not feeling up to the task. The holidays are an especially busy time of year for extra parties and events – work, neighborhood & family are examples. Take time to choose only 1-2 events that are important that you attend. These might be required for your job or you just simply don’t want to miss. Be mindful about your selection and take your time to RSVP. For social events that you might have attended with your loved one, ask yourself if you are ready for that situation. Imagine yourself in that environment. Who will be at the event? What will it be like to attend? Have an exit strategy! If it’s required that you attend, or you feel like you ‘should’ go, make sure you have a plan for getting out if things get too difficult. This might be driving a separate car or letting the host know you will be not be staying long. Write down events that can’t be missed and events you want to attend. *remember every year might be different, you only need to decide for this year right now. As you are planning your social events put ‘ME’ time on the calendar. Whether that is to get out into nature and hike, get a massage, read a book, take a bath, it doesn’t matter –just build in time to recharge your batteries. This could also include making time to be with close friends or family that help you feel connected and loved. Be sure to reach out to these people and let them know you might need some support during the holiday season. Below list people that you can connect with and/or activities that soothe your soul. And again, since people aren’t mind readers, let people know you are taking care of yourself by scheduling time to reflect and recharge. One of the most amazing ways to make sense of an anniversary or holiday season is to make it a little better for someone else. Unfortunately, there is so much suffering around the holidays – in this we are not alone. Donate to a charity in your loved one’s name. Give your time to helping others. Buy a gift for someone in a hospital or nursing home. Pay for the person behind you at Starbucks. Volunteer your time. The options are endless. Honestly, nothing soothes and heals our own wounds more than helping someone else. How can you help someone else feel comforted this holiday season? Giving doesn’t have to be financial – you can give of your time, you can donate clothes or other items you no longer use. Write down ideas you have. If you liked this post, sign up here for free regular updates. Your information will *never* be shared or sold to a 3rd party - Pinky Promise!